We’re very deeply connected to planet Earth, as I talked about in my book, PEMF - The Fifth Element of Health. But in the past 5 years since publishing the book, I have found even more evidence to support this premise. Let’s talk about the interconnectedness of all things. From quantum field theory, and entanglement, to chaos theory, all of life is very intimately connected. Add to this the wisdom of the spiritual traditions that reinforces this oneness and consciousness. The Birth of Energy Medicine begins with Understanding we are Bioelectromagnetic and Quantum Beings. We are physical, biological and electromagnetic (EM) beings, living in a tapestry of naturally generated, oscillating EM fields. Throughout the 19th and 20th centuries science mostly focused attention on the biochemical side of the human body and brain. That paradigm, however, is changing quickly and radically to a electromagnetic and quantum paradigm of the body. A shift from chemistry medicine to energy medicine. “Taking this back to Earth, I love to combine James Lovelock’s Gaia (Earth as a single organism) meme with those discussed above, while at the same time embracing Stuart Hameroff and Roger Penrose’s quantum physics model for the invisible interactions that happen in the microtubules of the brain – quantum consciousness. I suggest this is the perspective of EcoSentience – a return to seeing the human body, all life on earth and the Earth itself as a quantum organism. We will soon be able to envision the pulsations of the organism and the global mind through visualization convergence in the birth to the geospatial, semantic web. Global Coherence Initiative (GCI), a science-based initiative dedicated to shifting global consciousness from instability to coherence, and observing changes in Earth’s magnetic field using advanced sensing technologies to test the hypothesis that shifts in global consciousness will also shift the geo-magnetic field to benefit the planet and all life. 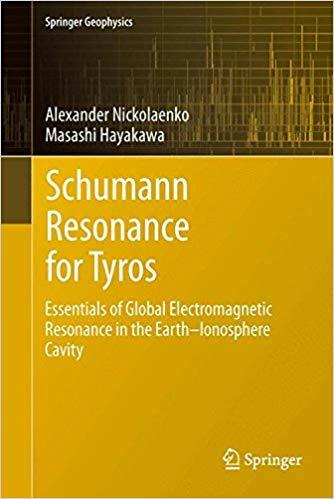 The Schumann Resonances and Geomagnetic frequencies are subtle vitally important frequencies and energies for life, perhaps one of THE MOST FUNDAMENTAL and important on earth. And better health is only ONE thing that tapping and supplementing the Schumann frequencies can do. It can help to elevate your consciousness and reconnect to alll people, life, the earth and Cosmos. By truly understanding the Schumann Resonant frequencies we can use this as a guiding light to understand the REAL science of PEMF! Earth's Magnetic Field is a Source of Energy for Life on Earth... food, water, light, electricity, magnetism, oxygen, prana... all elements of health and sources of energy. Now I’m going to get into defining those frequencies. They are the Schumann resonance, and the geomagnetic frequencies. You can think of the Schumann resonance as the heartbeat of the Earth. The Earth has an ionosphere. There’s a very complex interaction between the Earth’s neutral atmosphere and the Sun’s fully ionized charged waves. The ionosphere is this charged bubble of plasma, like a big soap bubble around the planet, that reflects frequencies. It creates this spherical cavity, and the actual frequencies of the spherical cavity is 7.83 Hz. It’s the Earth’s fundamental note. This frequency is created from complex interaction of the Earth’s ionosphere with the Sun. It becomes very energetic. We have around 7-million lighting strikes around the Earth from all this energy. This tremendous voltage potential between the atmosphere and the surface of the Earth creates all these lightning strikes. The strikes ring the spherical resonator to the tune of 7.83 Hz. It also has higher harmonic frequencies. ​There is an acknowledged, but as yet little understood, relationship between the solar wind, lightning, the ionosphere; and the Earth’s standing wave (Schumann Resonance) with human brainwaves and consciousness. "A continuous extremely low frequency (ELF) process is present in the geomagnetic field. Resonant oscillations in the ionosphere of the Earth and oscillations in the plasmasphere and the magnetosphere are caused by the solar wind. The peaks of the resonant characteristic of the system are called the Schumann resonances, and reside approximately on 100, 21, 14.1, 7.8, 5.7, 4, 1, 0.1 and 0.001 Hz"
And just as a piano has varying octaves of "C", so too does Schumann frequencies have higher octaves or harmonics, the primary ones being in the 0-50 Hz range, which as we’ll see in the next section is the most important frequency range for or body, mind and cells. It is important to note that the Schumann Waves are quasi-standing waves or scalar waves and as such are more fundamental then electromagnetic waves because they are everywhere present. One simple way to understand this is that the 7.83 Schumann scalar wave is the prime "channel" or broadcasting frequency for all of life on earth. Here we are, humanity, with our hearts and brains vibrating away at the same frequency as the earth. Energy and information getting exchanged. When you have two systems resonating at the same frequency you can transfer energy and information. It appears all animals and living organism are tuned to this frequency and its harmonics and it is the most important facet of the Earth PEMF (along with the earth’s magnetic field and its frequencies) that we need for life. We all march to the cadence of this cosmic drummer -- our planetary heartbeat, which sets the tempo for our health and well-being. When you arrange these primary frequencies of Schumann and include the well known 33.8 Hz frequency, you get a series VERY Close to the Fibonacci and the Golden Ratio Phi which is derived by dividing consecutive terms in the Fibonacci!! A final point to bring into the intrinsic order of life and how we are embedded into it is phi, the Golden Ratio. When we examine the numerical series of the Schumann Resonance and corresponding human brainwaves, 1, 3, 5, 8, 13, 21, 34…we find the Fibonacci series. 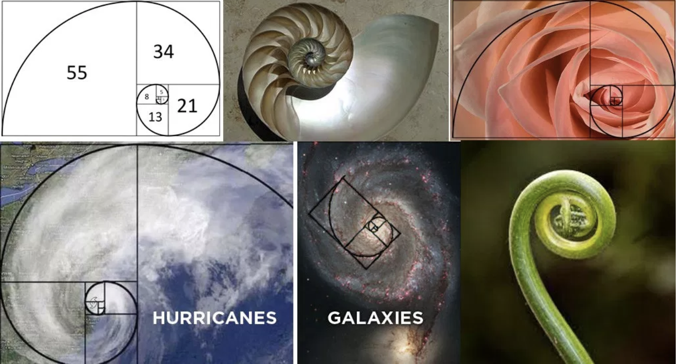 Spirals and Vortexes ABOUND in Nature and It Make Sense to Me that the Global Resonant Frequencies are Finely Tuned to Match the first several numbers in the Series!! where R is the radius of the Earth. The real Earth-ionosphere cavity is not an ideal one, so that real frequencies are a little bit lower than the values given by Eq. (3). Actually, peaks around 7.83, 14.3, 20.8, 27.3 and 33.8 Hz are experimentally found. The fundamental frequency (first harmonic) of ~7.5 Hz reflects the ratio of the velocity of light (3∙108 m∙ s-1) and the earth’s circumference (~4∙107 m). Subsequent harmonics are separated by intervals of ~6 Hz..
harmonics or modes of the Schumann resonance peak around 7.8 Hz, 14.1 Hz, 20.3 Hz, 26.4 Hz, and 32.5 Hz [5,6]. The typical strength of the electric field component is in the order of mV∙m-1 while the magnetic field component is ~1 pT∙Hz-1/2. harmonics. The fundamental frequency and intensity increase by ~.04 to .12 Hz and 0.11 to 0.41 pT, respectively  during strong proton events. -2), and m^3 is volume of the human cerebrum (~1.3∙10^-3 m^3). The solution is within the range of ~10^-20 J. This quantum unit of energy is associated with the effect of the 1.2∙10-1 V net change during an action potential of a neuron upon a unit charge (1.6∙10^-19 A∙s). That the activity of one neuron can affect the state of the entire cortical manifold has been shown experimentally . ​In other words, this single quantum of energy (10-20 J) from the Schumann resonance, represented within the whole human cerebrum, would have the potential to alter the state of activity by which experience and the representation of experience (memory) are strongly correlated. 1990 Study _ My Favorite Study because you can visually see how Electrosmog impacts our planet globally, namely the 50 and 60 Hz frequencies for power transmission. (SS), and Stanford, California (SU) for the interval January to March 1990. The spectrums are dominated by sharp spectral features of the power supply networks at 50 and 60 Hz. At the Stanford site, modulation frequencies at 30 and 90 Hz occur, which result from non-linearities of the power transmission system. Every spectrum exhibits a carrier frequency of 82 Hz with a modulation of 0.2 Hz that is produced by a Russian submarine communication system. A variety of other spectral peaks of unknown origin occur occasionally and distort the frequency range under consideration. Superimposed on the 1/f natural background, eight Earth-ionosphere cavity resonances can be distinguished. To break the model down into easily understood graphic images, picture this: Dozens of bolts of lightning strike the earth each second. These lightning discharges hit the ground. Then the waves bounce up to the ionosphere and are reflected back to the ground creating an oscillating EM field, between the surface and the ionosphere. there are about 40 to 100 lightning discharges per second globally (roughly 3 to 9million strikes per day). (Interesting Sidenote: This is the same range as the major “40 to 100 “Hz” activity associated with complex processes associated with complex cognition. 40 -100 strike per second = 40-100 Hz. Remember Hertz is cycles per second). Over the course of geological time, the daily lightning strikes set up a standing wave — which Tesla suspected and actually measured first in 1899 — but today is called the Schumann Resonance after a mathematician who predicted the phenomenon existed, which researchers verified in the early 1950s. This standing wave has an extremely low frequency (ELF), 7.8 Hz. Now here is where makes the bolt of lightning metaphor, for a stroke of genius, very real. The peak of the alpha brainwave is also 7.8 Hz. That means that the human brain is precisely tuned to the earth’s resonant EM field, generated by electricity. Take a moment and let that sink in...Literally!! The more you let the Earth's frequency's sink in, the more balanced and relaxed you'll feel. We humans are ELF receivers and transmitters, our brains are finely tuned to this naturally generated and sustained, global, electromagnetic field of the Schumann Resonance (and Geomagnetic frequencies too as we'll see). The brain state frequencies from low Delta to high Beta all operate within this natural Earth frequency range (as is well documented from EEGs since early 1900's). Low Delta is roughly .5-3 Hz. Theta waves are roughly 4-7 Hz. Alpha are 8-12 Hz, and Beta waves are 13-30 Hz. And Gamma waves are 31 to 50 Hz or even a little bit higher sometimes. Our brain activity is regulated by these well-defined brainwave patterns. In fact we have to cycle through them every day in order to maintain health and function in the world. In fact, it would appear that the Earth’s EM field acted as the waveguide for the evolution of the human brain-consciousness. 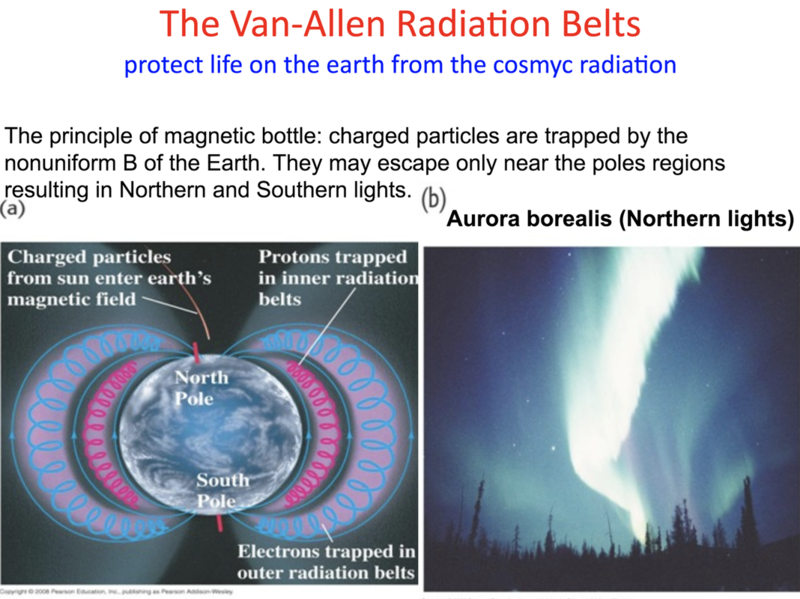 Biological life has always taken place in a sea of naturally occurring EM radiation of cosmic, atmospheric and geomagnetic origin, which can be categorized as terrestrial or extraterrestrial radiation. Extraterrestrial radiation consists of electromagnetic waves of different wavelengths, such as visible "light". It should be noted that the earth’s atmosphere acts as a filter for much of the extraterrestrial radiation, mostly in the UV frequency band. In 1992, Kirchvink et al conducted experiments on human brain samples and the results from these studies indicated that human brains contain trace amounts of magnetite or ferromagnetic material, which were found distributed over all cerebral lobes, the cerebellum, basal ganglia and midbrain. The main conclusion from these findings was that the magnetic senses or magnetoreception should share many attributes of other sensory systems, which include neural amplification and transmission pathways to direct signals to the brain. This magnetite or ferromagnetic material is shaped in such a way as to be optimal for use as a magnet. Considering that ferromagnetic materials interact strongly with magnetic field, there is a possibility that the interaction with external magnetic field could influence the brain tissue characteristics and possibly brain functioning. What this means is the brain and nervous system can AMPLIFY the very weak fields of the Earth's Schumann and Geomagnetic Frequencies. Electrophysiological signals (ECG, EEG, EMG, etc.) mainly originate from the cell membrane. According to the widely accepted Hodgkin-Huxley model, the cell membrane behaves as a capacitor electrically with a constant potential difference between the inner and outer side of -50 mV to -100 mV. This potential is due to the diffusion and drift of ions through the membrane and is called the ‘resting potential’. If a chemical or electrical stimulus raises the potential across the membrane for more than 20%, stimulus threshold is exceeded and the cell membrane resistance drops leading to membrane potential changes. It is becoming positive between +40 mV to +60 mV. This new potential can last for about 10 ms (refractory period) and is called an action potential. Bioelectric potentials originate from the action potentials of a number of cells and may be sensed by the appropriate electrodes. Electrocardiogram (ECG) is an electrical signal produced by synchronized action potentials (depolarizations) of a number of muscles in the heart. Such electrical activity, which is regular, causes heart muscle to contract. This synchronized muscle activity is vital. Any disturbance in the ECG electrical activity could be fatal. Similar electrical activity occurs in all other muscles but it is less synchronized. This is why heart field so strong. The electrophysiological signal produced during the muscle cells activation is called electromyogram (EMG). The human body can be considered as a very complicated living system with a number of different chemical, electrical and mechanical processes running simultaneously and continuously. As such, the system would have a number of different transfer functions for different processes and is expected to have possible resonant points for different processes. Resonant Frequencies of the Acupuncture Meridians (YES - They are the Earth Frequencies!). Skin is an important organ in the body and the most exposed organ to the environment. Electrically, skin behaves as a capacitor. Measurement of the skin electrical resistance is important for understanding and modeling of skin electrodes used in the measurements of physiological signals, such as EEG, ECG, EMG etc. It has been found that there are specific points in the skin with much lower electrical resistance. Interestingly, these points coincide with acupuncture point, opening a possibility to explain acupuncture effects by electrical conductivity. Traditional Chinese medicine hold that there are as many as 2,000 acupuncture points on the human body, which are connected by 20 pathways (12 main, 8 secondary) called meridians. These meridians conduct energy, or qi (pronounced "chi"), between the surface of the body and its internal organs. ***Lazoura, H.: The Design of Equipment to Measure the Electrical and Optical Properties of Acupuncture Points and Meridians, PhD Thesis, RMIT University, Melbourne, Australia, 2005. Lazoura results indicated that acupuncture meridians act as filters and hence allow only certain frequencies to pass through and attenuate all other frequencies. 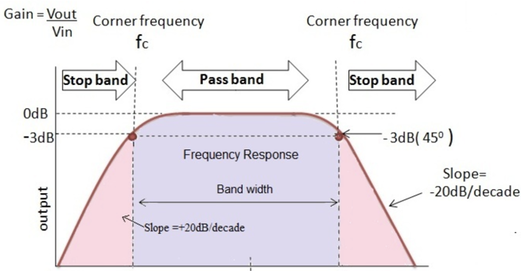 The fact that this pass band was set to low frequencies corresponds with the characteristics of acupuncture points, and with the spectral components measured traditionally in ECG and EEG signals. ​Figure Below shows the distinct spectral components of 4, 7.8 and 13 Hz which closely correlate well with the Nature’s own resonant frequencies. The correlation may indicate relationship between one’s existence and functioning as an integral part of nature and the Universe. It could also help explain the sensitivity of our bodies and mind to changes in the environment and even the universe, which has been used by our ancestors throughout time as a form of spiritual guidance and a form of healing. Study results prove that there is a correlation between the actual Schumann resonance peaks and electro-acupunture meridians. while one study proves a correlation between transfer function of Schumann resonance and electro-acupunture meridian. The results from our acupuncture meridians and EEG activity studies confirm that the human body absorbs, detects and responds to ELF environmental EMF signals. This is a classical physics phenomenon utilized in telecommunication systems. In engineering, a transfer function (also known as system function or network function) of an electronic or control system component gives the device's output for each possible input. Transfer functions - input frequency / output amplitude. Peak amplitudes at resonance. 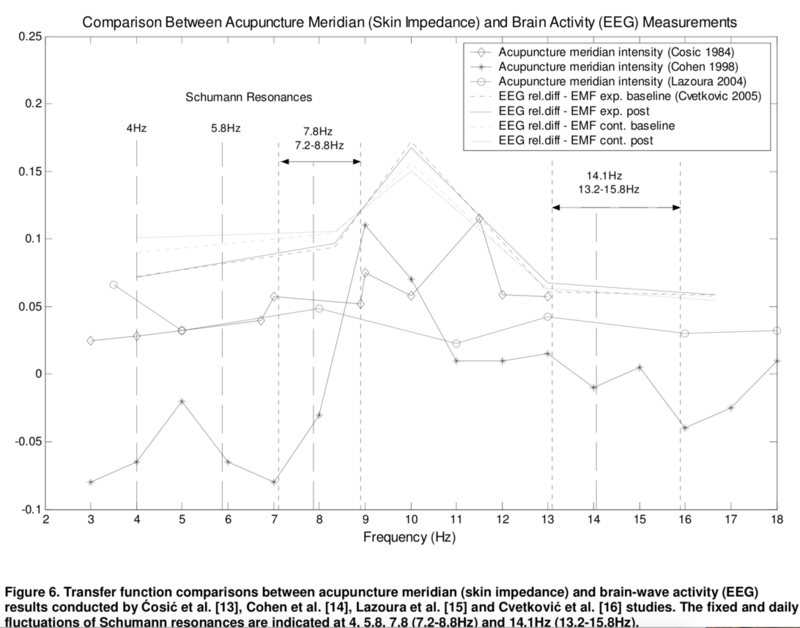 These results suggest that acupuncture meridians have a selective response to frequency. This response coincides quite well with the electrical properties of acupuncture points and meridians. Since acupuncture points have been found to have low resistance and a high capacitance, it is expected that they would act as a low pass filter with a cut-off set at a reasonably low frequency. Furthermore, a correlation with the resonant frequencies of our natural environment can be made. These natural resonant frequencies due to lightning-induced electromagnetic wave propagation between the earth and ionosphere have been shown to overlap with the characteristic spectral components of the EEG. If the meridians do in fact have the ability to transfer these resonant frequencies and reject others, the resonant frequencies may influence the health of an individual. Therefore, the ancient Chinese claim that health is based on energetic balance between organism and environment would prove to be valid. Traditional Chinese Medicine suggests that an energetic balance between organism and environment exists, and that this balance can be achieved by energy transfer through acupuncture points and meridians. Ćosić, I., Marinković, M. and Veljko, V.: Transfer Functions of Acupuncture Meridians, Digital Signal Processing , pp. 673-675, 1984. Cohen, M., Behrenbruch, C., Ćosić, I.: Shared frequency components between Schumann resonances, EEG spectra and acupuncture meridian transfer functions, Acupuncture and Electrotheraupetic Res., No.1, pp. 92-93, 1998. Cvetković, D.: Electromagnetic and Audio-Visual Stimulation of the Human Brain at Extremely Low Frequencies, PhD Thesis, RMIT University, Melbourne, Australia, 2005. A biological system that uses electromagnetic communication pathways is not likely to do so in a static way, such as using one narrow frequency band for a relatively long time period. Complex biological systems would most likely also use complex electromagnetic communication systems. A number of filters and windows would be likely to exist, both in terms of frequency, intensity and modulation. Addy and Bowen, way back in the ‘70s, showed that even at the cellular level, our cells seem to ideally respond to this frequency range. 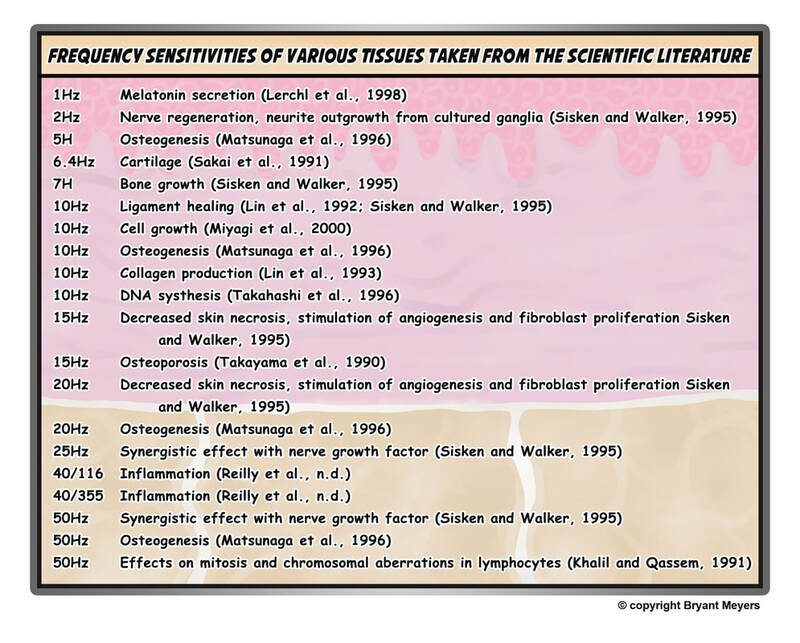 Sisken and Walker showed our tissues do as well. And Dr Zimmerman showed we even EMIT/RADIATE these frequencies of the earth. In his book on energy medicine, James Oschman detailed the frequency sensitivities of various human tissues. Most of the published research on PEMF and tissue regeneration and healing were all within in the 0-50 Hz range. The higher frequencies (70-200 Hz.) have corresponding lower frequency analogues. For example, osteogenesis and DNA synthesis are above 50 Hz. but they also have frequencies at 5 and 10 Hz. Note: This is one thing that differentiates PEMF machines versus Rife machines and other forms of energy medicine that use higher frequencies. There is a lot of good published research on these low frequency PEMF signals. In fact, there are over 30,000 studies on PubMed on PEMF since the 1970’s. 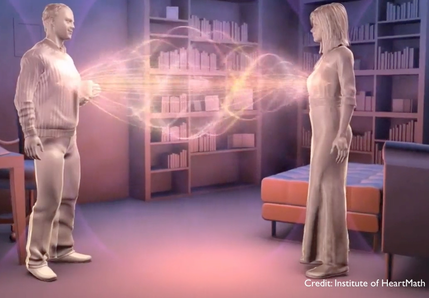 Even more fascinating, when I first read this I got goosebumps, Dr. Zimmerman and Dr. Seto showed through Reiki energy healers that we emit 30 Hz. to 50 Hz. range, and the frequency was around the main Schumann resonance. The body sweeps up and down this frequency range. When you’re getting a session from a Reiki healer, you’re basically getting Pulsed Electromagnetic Field therapy. This research was done with very sensitive magnetic field detectors called magnetometers. So we’re talking about actual, scientific measurable magnetic fields. To recap, our brains operate in this Earth frequency range. Our cells respond to this frequency range. The main published research on PEMF has shown this frequency range to be the most healing and the most regenerative. Our bodies even emit these frequencies. This frequency range represents the frequency of the brain, our cells, and even the frequencies we emit. There’s some fascinating research done by Nobel prize winning Dr. Luc Montagnier. He further demonstrates the importance of the Schumann resonance. Basically the Schumann resonance frequency is very unique in allowing DNA to assemble properly. If you take a vial of double helix fully intact DNA molecules, and put it next to a blank vial of water, and then saturate both vials with the Schumann resonance, it’s able to carry information from one test tube to the other. If you take the blank vial of water, and mix it with DNA precursor material, the result is fully reconstructed DNA, with 98% success. This has been duplicated in 11 labs. In full disclosure, not all labs have been able to duplicate the results. If you think about it, it shows you the connection between DNA, the blueprint of life, and the Schumann resonance. The Image shown below is the Geomagnetic frequencies of the earth which are a different source of frequencies to life on earth than the Schumann Resonances, though both are vital. These frequencies are very low from 0-2 Hz, with peaks in the sub hertz (below 1 hz). The Schumann frequencies range from 7.83 to roughly 50 Hz. **Interesting, the iMRS 2000 has a Sleep setting of .5 Hz which corresponds to one of the peaks in the Earth's natural Geomagnetic frequenices. Very few PEMF devices have this lower frequency setting. The geomagnetic field of earth is the magnetic field that our compasses align to and it radiates hundreds of thousands of miles out into space. We typically think our magnetic field is static and does not change. But it does...A little. Think of the flux or field lines of the field around the earth like guitar strings, and what happens when you pluck a guitar string? The earth's magnetic field has structural field line resonances, where these field lines can vibrate and resonate like a guitar string. So what is plucking the field lines of the Earth's magnetic field? The solar wind is plucking the field lines. The Solar wind is blowing 1 million miles per hour.... on a quiet day. This solar wind pulls out magnetic field on night side and get magnetotail. It is well established that the Schumann resonant frequencies directly overlap with those of the human brain state frequencies as I have talked about in my book and videos. Though note that the Geomagnetic frequencies INCLUDE the Delta Frequencies of DEEP sleep while the Schumann resonances do not. Along with Delta sleep , there are numerous physiological rhythms are ALSO synchronized with solar and geomagnetic activity, and disruptions in these fields can create adverse effects on human health and behavior. Examples include breathing rates, blood pressure rhythms, heart rate variability patterns and more (Heart-math has good research on this connection). The geomagnetic frequency is generated by the core of the Earth. It does have sub-Hertz frequencies between 0.1 and 0.5 Hz. There’s a main peak at 0.1 Hz and another spike at 0.4 Hz, that nicely connects to the Schumann resonance. It does cover all of your brain state frequencies. In my book I give more information about therse lower frequencies. On the left side of this graph at the top you see chaotic jiggles. The heart rate variability is a measure of the health of your central nervous system (it measures the interval between consecutive heart beats). The graph also shows blood pressure and respiration. At the 300 second mark in the middle, you see something happens. Things go from being chaotic to an entrainment, a resonance. What the subjects did in the study was practice one of HeartMath’s centuring techniques. When the subjects go into this positive emotion state, all their systems were in sync. There’s a peak at 0.1 Hz. It’s like the geomagnetic frequency with a peak at 0.1 Hz. 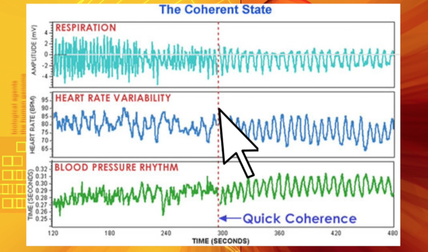 When I saw this connection between the geomagnetic frequency and this coherent heart balanced state of the body I really got goosebumps. Not only is the brain deeply connected to the Schumann resonance… there’s this deep connection between 7.83 Hz alpha state in the brain and the geomagnetic frequency from the core of the Earth. It aligns our hearts, and all the systems in our body. This is the same frequency as the main geomagnetic pulse. All the key systems in the body come into entrainment. They are all beating in unison. Synchronized. Health is coherence. When all of your body is connected and working together. So the body-mind-earth connection goes deeper. It’s actually the Body-Mind-Heart-Earth connection. All the different systems in the body are intimately connected to the magnetic field of the Earth, the Schumann resonance. The heart’s magnetic field can be detected several feet away. It’s the strongest field in the body. In fetal development the heart forms and starts beating before the brain is developed. Earth PEMFs area an essential Element of Health! If our bodies are blocked from natural exposure to these natural waves (e.g., due to living and working in buildings constructed with concrete, steel and metal alloys, driving in cars on paved roads, and by the electro-pollution of ultra-high frequency radiations from cell phones, microwave ovens, wireless phone and computer networks, and radar/satellite signals, etc.) we are more susceptible to illness, loss of cell membrane integrity, compromised immunity, and depression. ​Recorded dips in the Earth’s Schumann resonances have had strong correlation to heart attacks, car accidents, and a general increase in the death rate. Beck, R. Nexus Magazine, 1992. The heart field can be measured five feet away. The brain field can only be measured a couple inches away. The heart field is much more encompassing. Emotional states can be related to heart rate variability. The way the heart beats is related to the central nervous system. Different positive emotional states have a very distinctive frequency pattern. Negative emotions have a chaotic frequency pattern. Here’s an example: Have you ever walked into a room and you could cut the tension with a knife? You are feeling the fields. HeartMath has done studies showing we can sense someone’s field five feet away, even with a wall between the two subjects. We have the ability to sense other people’s magnetic fields and their emotional states. The Body-Mind-Heart-Earth connection is very profound. And this is one of the reasons why I recommend a low-intensity, low-frequency PEMF device, like the iMRS 2000. You want the frequency range to be 0-50 Hz. and you want a lower intensity level. By supplementing with an Earth-based PEMF session every day, you are restoring balance and coherence. It helps your body to synchronize. This is why you want to use a low intensity. You want to gently nudge the body back into entrainment. You should also eat a good diet, drink plenty of water, get out into the Sun, and have positive emotions. More like a ball of lightning living on a bigger ball of lightning. Earth AND Body much more electric and magnetically dynamic that Geology and Biology Textbooks illustrates. Its like looking at a slide of a dead cell vs living cell. Energy and Electricity IS LIFE. Textbook show cadaver based images (including slides of dead cells). Also. the Global Coherence Initiative and HeartMath have sensitive magnetometers around planet Earth that measure the Schumann resonance on a daily basis. 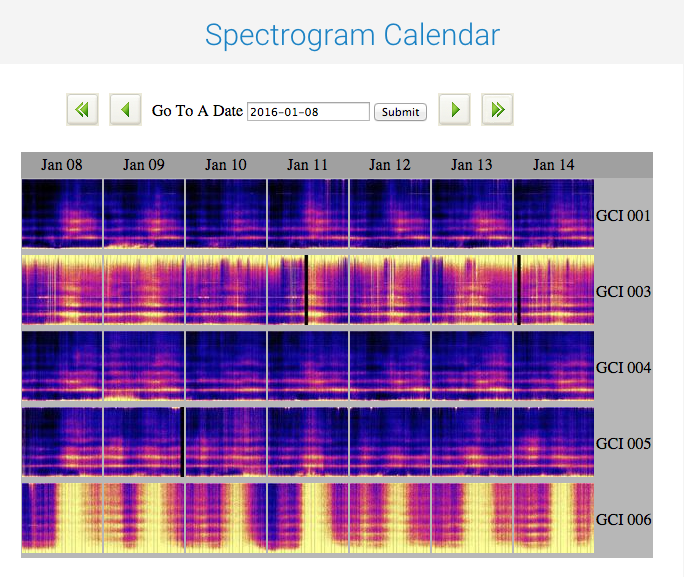 Contrary to what the New Age people are saying, the Schumann resonance is not going up. It’s still 7.83 Hz with higher harmonics. Schumann Resonance Intensity and Frequency Vary over the years and seasons based on Solar Activity and Seasonal Weather Patterns. 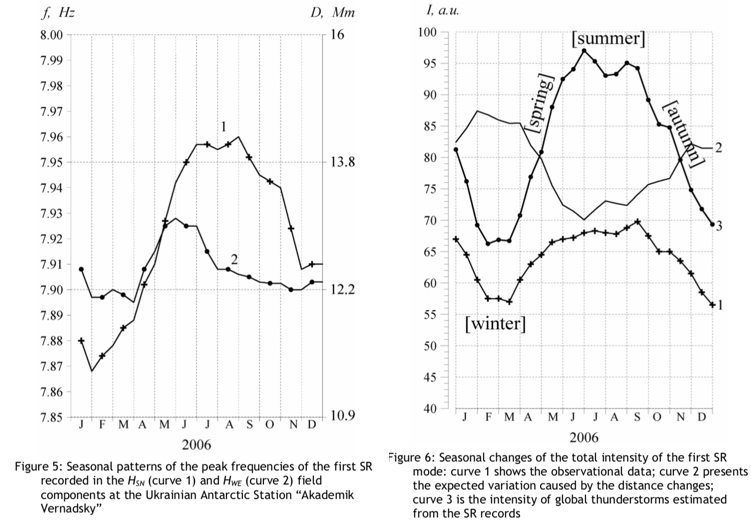 Typically seasons and years where there are more lightning strikes, the Schumann intensity goes up. Where the frequency depends on the height and structure of the Ionosphere (Geometric). Even from Day to night it varies a little because of the Solar wind changing course from day to night. 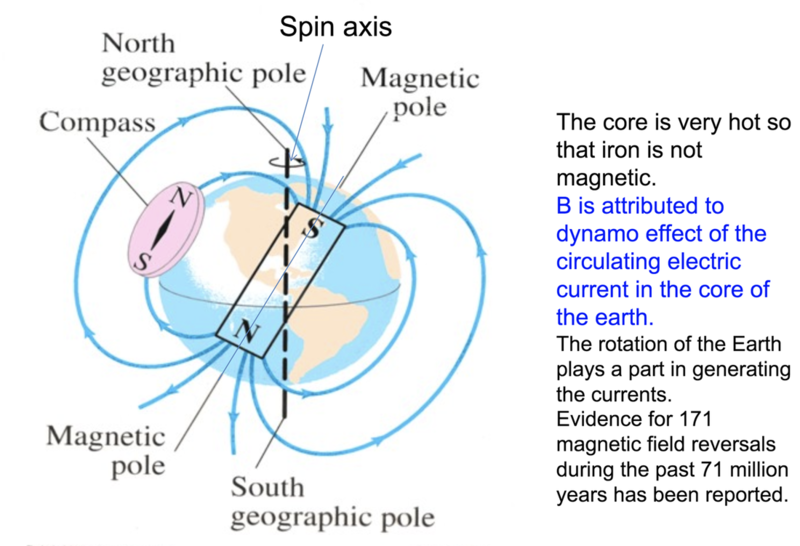 Earth’s magnetic field comes from the electric current generated in the conductive layer of molten iron in its outer core moving across the Sun’s magnetic field, which in turn generates a magnetic field. Birds, bees, amphibians and other animals are known to depend on Earth’s magnetic field for navigation. There are reports that animals and humans in environments shielded from Earth’s magnetic field aged faster, died more readily, suffered stress and pains, and pathological changes in the liver, kidneys, white blood cells, and urinary bladder . Earth also has an electromagnetic spectrum or Schumann resonance named after Winifred Otto Schumann (1888-1974) who predicted them in 1952. Schumann resonances are standing waves created in the space between the surface of the earth and the conductive ionosphere, and naturally excited by lightning discharges. 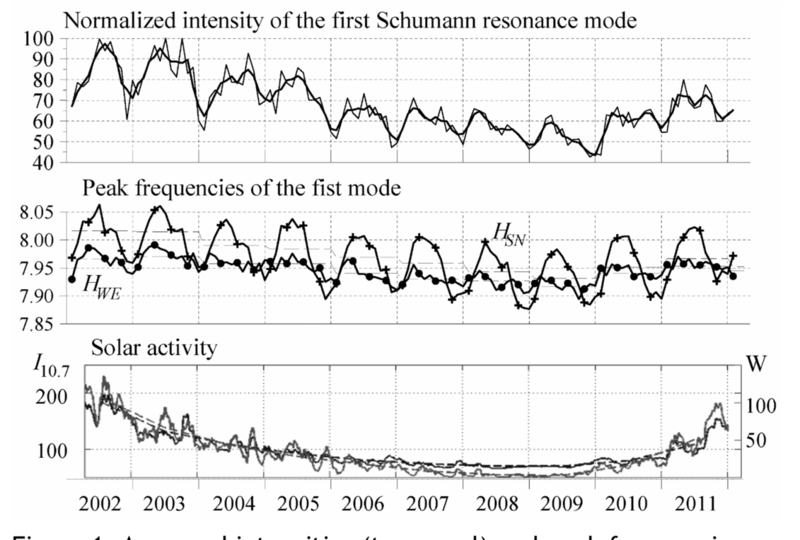 Schumann resonances range between 3 and 60 Hz, appearing as distinct peaks at 7.83, 14.3, 27.3 and 33.8 Hz. These same frequencies are prominent in human brain waves and strongly correlated with different mental states. Evidence suggests that humans and other organisms actually synchronize their biological rhythms to the Schumann frequencies [5, 6]. Earth’s electromagnetic activities are strongly affected by those of the sun. The beautiful northern lights are generated during periods of intense solar activity, or magnetic storms, when the solar wind carrying hot energetic plasmas of ionized particles from the sun increases in density and speed. The ionized particles are trapped by Earth’s magnetic field and accelerated towards its magnetic poles. Collisions between these ions and atmospheric atoms and molecules (mainly oxygen and nitrogen) cause light to be emitted as the excited atoms relax back to the ground state. Both higher and lower than average levels of solar and geomagnetic activities are associated with adverse health and psychological impacts on humans worldwide, possibly due to the suppression of the pineal gland secretion of melatonin as biological rhythms are desynchronized. This is also partly why artificial electromagnetic emissions from mobile phones, wireless, high tension power lines are having dire effects on humans and wild life [7-10] (Drowning in a Sea of Microwaves, Cancer Risks from Microwaves Confirmed, Mobile Phones and Vanishing Bees, Mobile Phones & Vanishing Birds, SiS 34). 5. Palmer S, Rycroft M and Cermack M. Solar and geomagnetic activity, extremely low frequency magnetic and electric fields and human health at Earth’s surface. Surveys in Geophysics 2006, 27, 557-95. 6. Cherry NJ. Human intelligence: the brain, an electromagnetic system synchronized by the Schumann Resonance signal. Medical Hypotheses 2003, 60, 843-4. From a global perspective the Earth is covered by a permanent lightning storm (almost a 100 a sec). The electro- magnetic impulse from a flash of lightning in the tropics is transferred around the Earth’s circumference at the speed of light, creating electromagnetic resonance. Winfried Otto Schumann discovered that the space between the Earth’s surface and the conductive atmosphere (ionosphere) functioned as a waveguide (or spherical capacitor). This is because the ionosphere is capable of trapping electromagnetic waves. The nearly 100 lightning strikes that occur globally each sec in this cavity create electromagnetic resonances with a fundamental frequency of 7.83 Hz. According to König this resonance frequency of the Earth is extremely stable. König H.L. Zeitschrift angewandte Bäder-Klimaheilkunde 9:481-501, 1962. ​High intensity PEMF is a vestige of Newtonian and Mechanistic thinking applied to the newly emerging understanding of the Human body as a multispectral and holofractal graphic vibrational being of light, electricity, electric fields, magnetism, sound/vibrational existing within a radically interconnected webwork of the body's connective tissue matrix and exotic states of water chemistry that exist quantum coherence. This Living matrix is intimately coupling to the Earth and Cosmos and extends down to the very nucleus and DNA. It is this interconnectedness with Nature's energy's that life has coevolved with and what life NEEDS as the Elements of Health. That paradigm, however, is changing quickly and radically. There is an acknowledged, but as yet little understood, relationship between the solar wind, lightning, the ionosphere; and the Earth’s standing wave (Schumann Resonance) with human brainwaves and consciousness. In fact, an amazing, interlocking synchronicity exists between these phenomena, which clearly reveals just how interwoven the threads of life, the earth’s EM pulse, and awareness truly are. A research team led by Australian university professor Irena Cosic published a paper the author herein quotes with permission. To break the model down into easily understood graphic images, picture this: A bolt of lightning strikes the earth, (about 2000 thousand do every day producing 50 strikes per second) the lightning discharges hit the ground. Then the waves bounce up to the ionosphere and are reflected back to the ground creating an oscillating EM field, between the surface and the ionosphere. lightning Over the course of geological time, the daily lightning strikes set up a standing wave — which Tesla suspected and actually measured first in 1899 — but today is called the Schumann Resonance after a mathematician who predicted the phenomenon existed, which researchers verified in the early 1950s. that given the usual 4.5 m∙s-1 bulk velocity of action potentials within the cerebral cortices, the approximate standing wave or resonance for a 60 cm circumference skull would be ~7.5 Hz. This bulk velocity would require ~20 to 25 ms to traverse the cerebral length and is equivalent to about 40 to 45 Hz. The 40 to 45 Hz band is the classic frequency associated with “consciousness” and other complex biological functions. 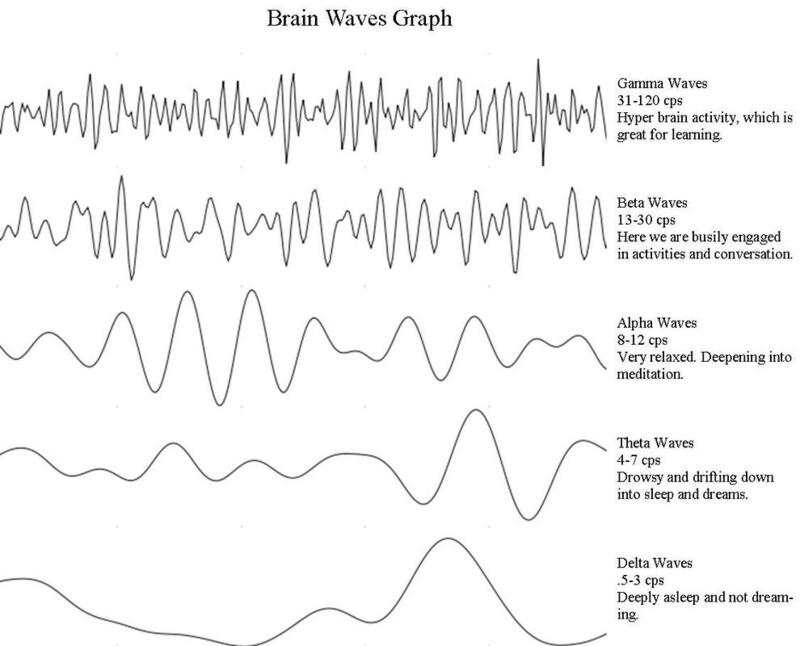 As demonstrated by Llinas and his colleagues  the “40” Hz repetition and phase modulation of an integrated cerebral electromagnetic field defines two states: the waking state and the state associated with dreaming (rapid eye movement or REM sleep). Stated alternatively, the earth’s magnetic field if coupled to the Schumann resonances would have the potential to represent (“store”) the information or neuronal firing patterns from every brain of every human being who has lived on this planet. Global Coherence Initiative has evidence to validate this!! We are intimately connected to Nature, our body, mind , emotions and consciousness AND further we are all interconnected TO EACH OTHER (at one way of many) by the Geomagnetic and Schumann Resonances. Despite the modern understanding of magnetism, the shroud of mystery surrounding lodestone for so long has never been completely eliminated. In recent years, scientists have questioned exactly why lodestone is relatively rare compared to other kinds of magnetite. Dr. Peter Wasilewski of NASA's Goddard Space Flight Center recently demonstrated that only magnetite with a specific composition and crystal structure has the potential to become lodestone. The pieces of magnetite that naturally realized this potential, Wasilewski believes, did so by being struck with lightning. The electric discharge that accompanies lightning creates a temporary, but very strong magnetic field. This field, Wasilewski argues, is strong enough to magnetize lodestone, while the earth’s magnetic field is not. ​Wasilewski has successfully demonstrated the magnetization of pieces of magnetite at a laboratory in New Mexico that specializes in lightning studies, providing strong support for his theory.